Yesterday when I was grocery shopping I decided I'm going to have fruit salad for my purple containers. I'm still having a really hard time saying no to bad foods but I'm trying to stick to the 21 day fix meal plan as best as I can. Fruit salad is my favorite way to eat fruit because you get to eat a bunch of different fruits at once - you don't have to decide if you want a banana OR an apple. 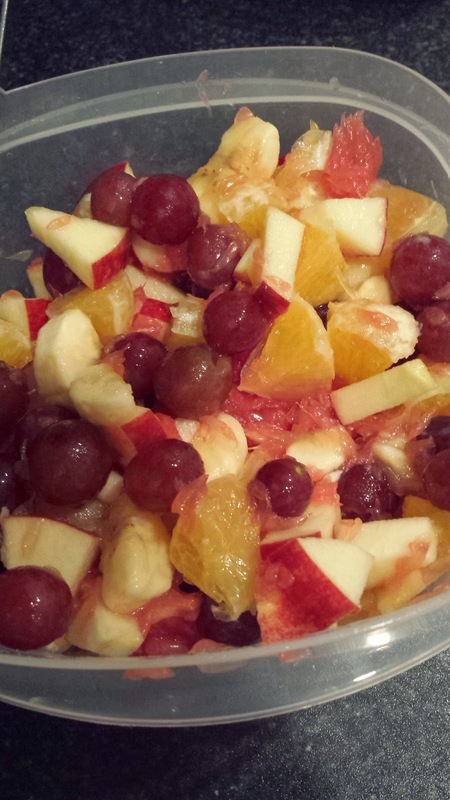 These are my favorite fruits for fruit salad. I should have grabbed a melon (cantaloupe or honeydew) but that'll have to wait until next time. I love the combination of oranges and grapefruit, the citrus just adds that something something to it and prevents the apples and bananas from turning brown. I like to cut my fruit into fairly small pieces so I can have a bit of everything in every spoonful :) I cut the banana in half lengthwise and then cut into slices. In May I started Melissa Bender's 30 day sculpted abs challenge. I haven't finished it but I have about half left so I'm going to finish them and then I want to finish the rest of the free ZWOW's since I made it up to ZWOW #52. Here are the links to the videos and the workout breakdowns! Alright... so my last post was about recommitting to the 21 Day Fix diet but I was defeated again. Sugary treats and unhealthy dinners are going to be my demise. But I refuse to quit trying. For workouts I've been doing the challenge from my friend's website, HIITmx. You sign up and you get an email every day that has your workout break down (in English, even those his website is in Spanish. If you use Google Chrome is has the option to translate it.) His workouts are awesome! They work every body part and my abs are getting more defined just in the short time I've been doing the videos. Some days I do 6 rounds for a 40 minute workout and some days I'll do 4 rounds and pair it with a Beachbody video (Focus T25, Turbo Fire, PiYo).